Built by Morris Yachts and Boston Boatworks, Visions of Johanna is a yacht designed for safe, comfortable ocean voyages. The greatest satisfaction a yacht designer can attain is to assist an adventurous family to achieve a goal that even the most active sailors rarely undertake - a circumnavigation. The fact that so many sailors yearn to cut ties to the stress of shoreside life yet so few do so attests to the determination required to actually accomplish this goal. The yachts these intrepid souls have us design for them are as varied as they are capable. Visions of Johanna is a purpose designed circumnavigator. 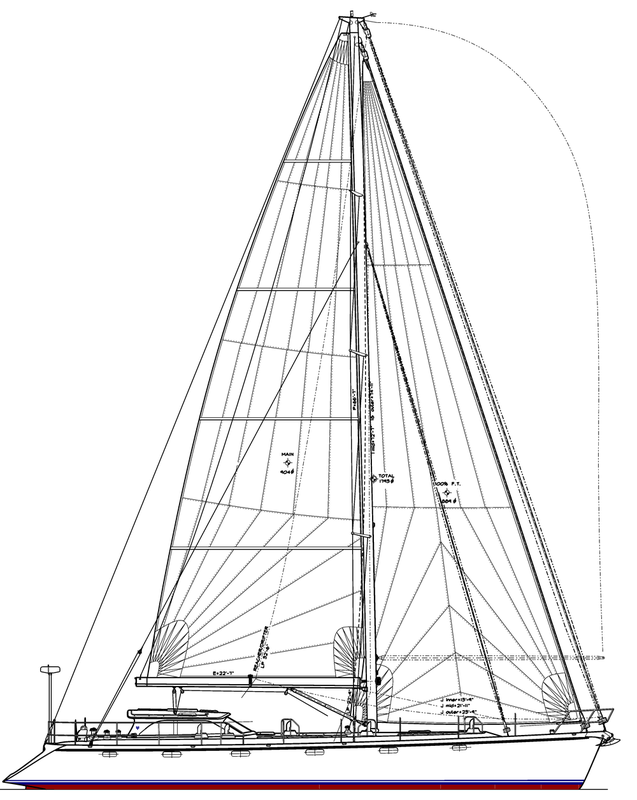 Bill and Johanna Strassberg, who commissioned her design, were experienced sailors who at the time owned an Alden 44. For their trip around the world they were looking for the added safety and speed that a larger boat would provide as well as the dry shelter of an enclosed pilothouse. The arrangement we drew is well suited to passagemaking. The small cockpit leads to the pilothouse where foul weather watches are stood in dry comfort. Below, the sea berths, day head and galley are all located aft near the companionway. There are no wide open spaces for bodies to fly across and a secure handhold is never out of reach. In addition to her sailing capabilities, Visions is a superb powerboat. A powerful, high torque John Deere engine with a deep reduction gear was installed along with an innovative, leak free shaft system provided by Evolution Marine in Rockland, Maine. Sound damping and vibration control specifications were provided by Soundown. Visions easily makes 9-1/2 knots with the engine turning over at 2100RPM. In the cockpit, all you hear are the waves. The hull and deck were built of fiberglass and epoxy resin at Boston Boatworks and the interior and systems were expertly constructed at Morris Yachts.